Unbeknownst to many, there is no one-size-fits-all when it comes to trespassing in New Jersey. In fact, a charge for criminal trespass in violation of N.J.S.A. 2C:18‑3 can refer to the unlicensed entry of a structure, an act of defiant trespass, or peering into a dwelling. In other words, the specific circumstances that surround a trespassing case will determine the degree of the charges and the penalties to which a person is exposed if convicted. Fortunately, there are numerous defenses that can be used to have a trespassing charge dismissed in New Jersey. If you have been charged with criminal mischief in Camden County, an experienced criminal defense attorney can ensure that you understand and pursue all available strategies to potentially get the charges dropped. By avoiding a conviction, you can prevent fines, a criminal record, and even jail time. At our Camden County criminal defense law firm, our highly skilled criminal lawyers are committed to delivering superior results for clients charged with trespassing, burglary, criminal mischief, and other criminal offenses in South Jersey. With a reputation for excellence, our featured attorney William C. Fay employs his time at the New Jersey Attorney General’s Office, where he served as a Deputy Attorney General, to effectively challenge the State’s case against our clients. With local offices, our team has successfully represented countless clients in Camden County. To learn more about how we can help you, contact our firm today at 609-832-3202 for a free consultation. a. Unlicensed entry of structures. A person commits an offense if, knowing that he is not licensed or privileged to do so, he enters or surreptitiously remains in any research facility, structure, or separately secured or occupied portion thereof. An offense under this subsection is a crime of the fourth degree if it is committed in a school or on school property. The offense is a crime of the fourth degree if it is committed in a dwelling. An offense under this section is a crime of the fourth degree if it is committed in a research facility. Otherwise it is a disorderly persons offense. As you can see from above, there are several different types of criminal trespass. The first involves unlicensed entry or remaining in a structure. Notice that the type of structure is important in the grading of the offense. If the offense is committed in a school, on school property, in a dwelling, or in a research facility, trespassing is a fourth degree crime. If none of these apply, criminal trespass is a disorderly persons offense. The second type is defiant trespassing, which applies when a person enters or remains in a place after being warned against it. The fact that you are not entitled to be inside can be indicated through a variety of means, including fencing, “No Trespassing” signs, or verbal communication. Defiant trespass is a petty disorderly persons offense, which is the lowest-level criminal offense in New Jersey. Lastly, trespassing law encompasses what is known as “peering.” This type of offense involves looking through windows or openings in a dwelling without the observed person’s knowledge. Peering is often referred to as “invasion of privacy.” This type of trespassing is a fourth degree crime. It is important to note that trespassing can be considered an act of domestic violence if it is against a former spouse, partner, or other person who qualifies as a victim under the NJ Prevention of Domestic Violence Act. If you are charged with trespassing in the context of domestic violence, you may also face a restraining order. Depending on the type and degree of criminal trespass, the potential penalties can vary significantly. Specifically, a petty disorderly persons offense for defiant trespass is punishable by up to 30 days in jail and a fine up to $500. A disorderly persons offense for unlicensed entry of a structure is punishable by up to 6 months in the county jail, a maximum fine of $1,000, and a conviction on your criminal record. A fourth degree crime for peering or trespassing is the most serious type of trespass offense and is punishable by a New Jersey State Prison term of up to 18 months, as well as a maximum fine of $10,000, and a felony on your criminal record. 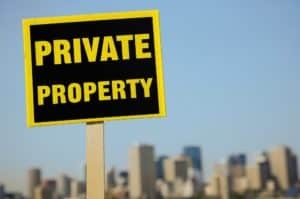 There are several others potential consequences associated with trespassing in New Jersey, including probation, driver’s license suspension, and restitution payments to the victim. There are numerous ways to defend against trespassing charges in New Jersey. For example, if the structure was abandoned or if the place was open to the public at the time of the alleged offense. You can also successfully get trespassing charges dismissed by demonstrating that you reasonably believed the owner of the structure, or other person empowered to give you access, would have allowed you to enter or remain, or, in the case of peering, to look through a window or opening. If you or a loved one has been charged with trespassing in Camden or Burlington County, having an experienced criminal defense lawyer on your side can truly spell the difference between a positive and negative outcome. At our criminal defense law firm, our Camden County, NJ criminal attorneys always pursue the best possible outcome, whether it involves an outright dismissal at trial, having the charges downgraded to a lesser offense, or securing your enrollment in a diversionary program whereby the charges are dropped and you avoid a criminal record. For a free consultation about your specific case, contact us anytime at 609-832-3202. We are happy to provide you with a free case evaluation.